China and Canada are becoming more connected every year and 2019 is no different. In Canada, there are millions of people with a Chinese background. Thousands of students come from China to Canada every year to study at some of the world’s most prestigious universities. China’s expanding economy has also resulted in an increased demand for English teachers, foreign talents, and business opportunities. This creates a lot of documents that often need to be used in both countries. For example, University Degrees and police checks are often required for things such as job applications, immigration, and future studies in China. Family affairs often require the use of marriage certificates, birth certificates, death certificates, and divorce certificates. 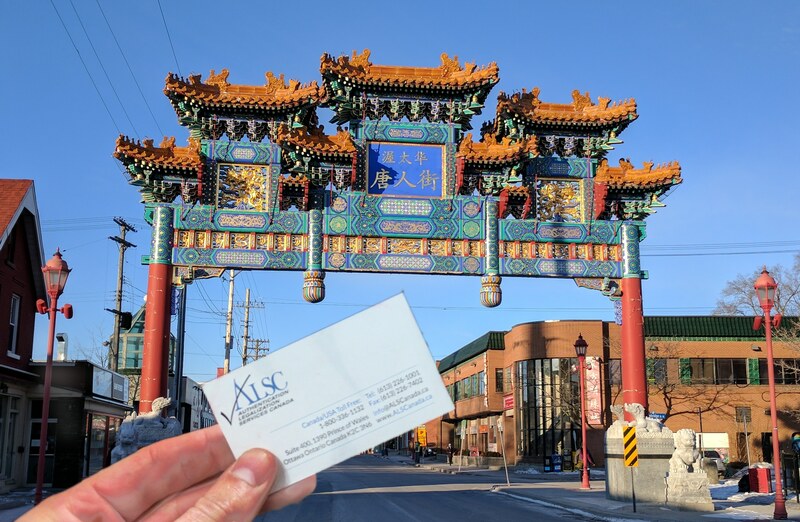 Businesses looking to expand their markets frequently provide Certificates of Incorporation, Articles of Incorporation, Board Member Resolutions, and Tax Residency Letters if they want to do business in China. However, documents are not accepted in foreign countries until they have gone through a process of validation. The most common process for this is known as an apostille. In contrast, Canada uses an equivalent process called authentication and legalization since we did not sign the Hague Apostille Convention. If you have a Canadian document that needs to be used in China, you will have to go through this process. Authentication and legalization is straightforward: it involves validating signatures on documents. However, it can take a very long time to do without help. This is for multiple reasons. The first step of authentication usually takes place at Global Affairs Canada in Ottawa and they have a series of requirements that must be fulfilled and change depending on what kind of documents you have. Their processing time for documents received by mail can be more than 20 business days, and this is assuming you have met their requirements for your documents. The second step of legalization at the consulate of the embassy of China also has its own requirements for corporate and personal documents. These requirements are not always easy to figure out and can take a lot of time to put together properly. This is in addition to the processing time of the embassy. As you can see, it can sometimes take months to have your documents properly authenticated and legalized for use in China. These reasons are why our company exists. Over 25 years we have built a very strong relationship with Global Affairs Canada and the Chinese embassy in Ottawa. We are trusted by their consular staff and are always up to date on their changing fees and other requirements to ensure our documents get accepted; we save our clients valuable time and ensure their documents get authenticated and legalized, regardless of their use. That’s our service guarantee. On our priority service your documents are authenticated on the same day they arrive in our office*. We also offer a convenient and affordable 3 business day service and a 10 business day option if you have multiple documents that need processing. Let’s go through some of the most common documents that are required for use in China and how we can help you with them. *if your documents arrive before noon. University degrees are often requested for job applications and are a requirement for future studies in China. Since graduating is a great achievement, it is likely that you still have your degree with you or in an accessible location. If you do not, you can contact your university directly and they can issue an official copy of your original degree for a fee. To speed up authentication and legalization, you can have the degree sent to our office directly to begin processing. This can save valuable time especially if you are rushing to meet a deadline. It is important to note that degrees come in all shapes and sizes. It is crucial to know the dimensions of your degree as it will determine the shipping costs regardless of whether you use our service. If your degree is very large, it is recommended you make a notarized copy to save on shipping costs (if it will be accepted by the requesting party). This is also recommended if you wish to keep your degree in good condition, as larger degrees are occasionally damaged during shipping and when they are handled by staff at the embassy. We can make a notarized copy of your degree for you when you use our services. At ALSC, we always handle our documents carefully and we ensure they are kept in the best condition possible throughout the process. We are also able to accommodate almost every degree and document size and have special protective shipping envelopes available at no additional cost for all our clients, regardless of the document or service speed. Use the links below to order a new degree or diploma if yours has been lost or damaged. RCMP checks and police checks are often requested by employers in China. Luckily, RCMP checks are easy to get if you don’t have one. They can be ordered from the RCMP headquarters in Ottawa, Canada and sent to any destination worldwide. However, we recommend you have it sent directly to our office which is also located in Ottawa. This is especially recommended if you are abroad, as it is possible to have your RCMP check authenticated and legalized faster than the time it would take for it to first travel to you by regular mail. Other police checks can also be ordered from local Police Stations across Canada. However, original police checks not issued by the RCMP cannot be authenticated by Global Affairs Canada. A notarized copy of the police check will first have to be made by a lawyer or notary public. We can do this for you when you use our services. Please note that it is always important to confirm with the requesting party which police check they require, as well as any additional documentation they might need. Although our service guarantee ensures your documents will be accepted in China, we do not guarantee your requesting party will accept them, so make sure you have the right one. If you want to find out more about the RCMP process to get a criminal record check here is a link. To make it easier to get a Canadian criminal record check for our clients inside Canada we recommend using any of the Commissionaires of Canada offices located across Canada. For clients outside Canada we recommend using the National Pardons Centre you can find out more about them here. In both cases the fingerprinting agency will be able to have your criminal record search results sent directly to our Ottawa national office to save you time and money. Canadian vital statistics documents like birth certificates, marriage certificates, and death certificates are some of the most important documents that can be issued. They are required to attain things such as a dual citizenship in China, to get married in China, to immigrate to China, and to claim an estate or resolve inheritance in China. However, they are often misplaced since they are rarely used within Canada. If you have your documents with you then you are ready for our authentication and legalization service. This is because vital statistics documents do not require the stamp of a lawyer or notary public. In short: they are good to go! Notarized copies can still be made but are not required or recommended since new originals can often be obtained at a cheaper price than a notarized copy. All you must do is send us a scan of your document to ensure it is the right form: short form versions of these documents are not usually accepted by Global Affairs Canada for authentication or the Chinese embassy for legalization. If you need to order these documents we recommend you have them sent directly to our office to save you time. Use the links below to order your birth certificate, marriage certificate, or death certificate. There are many documents which are used for business purposes in China. Certificates of Incorporation, Articles of Incorporation, Certificates of Amalgamation, Certificates of Good Standing, Board Member Resolutions, CRA Certificate of Tax Residency, and Agreements are a few of the many documents required for business abroad. The documents you will require will depend on what you are trying to do, and this information will have to be obtained from the requesting party in China. Most of these documents are issued by federal bodies Industry Canada and if notarized we can help you authenticate and legalize them for use in China. This also applies to provincial issued certificate of incorporation’s. Canadian Corporations who are exporting to China or using Chinese manufactured parts on their products for export outside Canada will require authentication and legalization. To qualify for the China Authentication and Legalization process, the Chamber of Commerce in your area will need to assist you with certification of your export documents. The Chamber of Commerce plays an important role in the Certificate of Origin Authentication Legalization process and are further recognized as the non government official business accreditation agency in most foreign countries such as China. After meeting the Chamber of Commerce requirements they will sign and stamp your Certificate of Origin and Commercial Invoice then you will be ready for the authentication process at Global Affairs Canada and then finally legalization Embassy of China which is located here in Ottawa close to our ALSC HQ office which makes processing fast and simple for our clients. It is important to note that the Chinese embassy refers to the second process of legalization as “authentication” which can be confusing. How do you get started? If you live in or near Vancouver, Victoria, Surrey, Calgary, Edmonton, Regina, Winnipeg, Toronto, North York, Mississauga, Halifax, or Montreal, you can drop off your document at one of our service centers once you’ve made an appointment at our head office. This saves you the hassle of having to go to the post office and your documents will receive free priority shipping by FedEx to our head office in Ottawa for processing. Once completed they can be picked up at our service center or shipped to any global destination of your choice with our shipping partners at an additional cost. If you are currently not in Canada or must order new documents due to damage or loss, remember that you can have your documents sent directly to our office to save even more time. We know that the process of authentication and legalization can be very stressful, especially if you have a deadline to meet. As the leaders in our industry, we are here to help you with your document needs and relieve that stress. We will provide you with updates from start to finish, giving you peace of mind and saving you valuable time that can be better spent with family and friends. 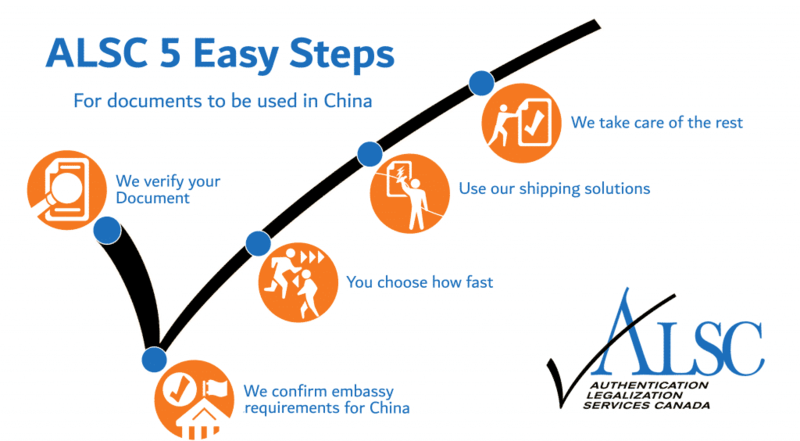 You can relax knowing your documents are in the hands of the experts and that we will do everything we possibly can to provide the fast and efficient service you deserve and ensure your affairs in China are addressed with no delays. If you want to read more about working in China and what Canadian documents are required find out more here. Click below to get started with the China Authentication and Legalization Specialists.